Get your business noticed with an effective Sidewalk Sign Stand, Sandwich Board Signs andSigns for the Sidewalk. Store. Signs for the Sidewalk, also known as Sidewalk sign stands and sandwich board signs, call attention to your storefront or in-store promotios. They can easily be changed or moved to adapt to your particular needs. We have a wide variety of sidewalk sign stands, from the changeable high wind sidewalk sign that uses water or sand in its base, to a swinging sandwich board sign that is writable to create your own message. "Tip and Roll" model signs for the sidewalk are also available and easy to maneuver and store. All of the sidewalk sign stands, sandwich board sign, and signs for the sidewalk are designed to get your message out fast, and to give you the flexibility to change your promotion or theme quickly and easily. Driving traffic into your store just got a little easier with sidewalk sign stands, sandwich board signs, and sidewalk signs from Sign Bracket Store. 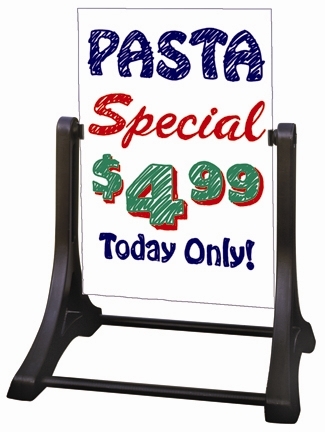 Call us about customization or branding the frames of your sidewalk sign stands. Businesses in urban areas have to compete for the customer’s attention, and by using sidewalk sign stands, sandwich board signs, and signs for the sidewalk, merchants gain an advantage over the competition. Signs for the sidewalk, or sandwich boards are an effective, easy and inexpensive way to promote your company and drive traffic into your store. Sign Bracket Store has a variety of options to fit your industry needs. These sidewalk sign stands can be as straightforward as a Two Sided Writable Sidewalk Sign Stand that you can change daily (or hourly if you prefer) by creating your own sign and promotion. Another option is our changeable letter High Wind Sidewalk Sign for windy avenues; it uses sand or water in a base to keep it steady and has 2 galvanized springs to withstand winds up to 40mph. For the ultimate in easy Sidewalk Sign stands, we have the “tip n roll” sign stand. It really is as effortless as it sounds, simply tip the sign stand down and roll it out during business hours, and tip and roll it back in to store it over-night. The Tip N Roll sidewalk sign stand comes with changeable lettering, or you can select the option to create or write your own sign. Sidewalk sign stands, sandwich board signs, and signs for the sidewalk should be a part of your marketing strategy, announcing new promotions in a professional and straightforward manner. We can customize parts of your sign frames to allow for logo applications or elements of your brand. Call us at 888-919-7446 with questions or email us at sales@signbracketstore.com for a quote.